The space of the prairie provides an opportunity to express what I call a “moment of grace”. It’s formed by the light, the time of day and a host of indeﬁnable elements. Certain qualities of light transform the ordinary. They take a familiar landscape and reveal the uniqueness that is its own particular beauty. This quiet process instills in us something powerful and deeply felt. 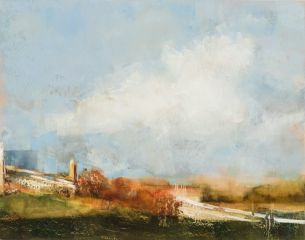 In these landscapes of prairie and the community where I live, I have tried to create a sense of intimacy and connection. I’m painting a particular moment in time. 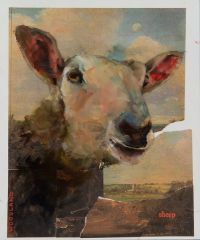 These portraits of domestic animals relate to my childhood on a farm in Southern Ontario.The landscape I remember was like a painting by Constable, lush and pastoral. The animals who shared this landscape were dependent upon us to care for them. Their existence was interwoven with our own, sharing all the cycles of life. In that way, they lived in a parallel universe. In today’s world, domestic animals have become increasingly remote from most peoples’ experiences. I hope these intimate portraits provide an opportunity to see them as the sentient creatures they are.